The colours came from the latest Stamping 411 Colour Inspiration - old olive, not quite navy, close to cocoa and more mustard. 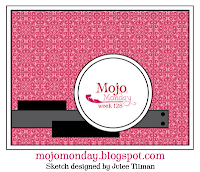 The design was inspired by the latest Mojo Monday sketch, although as you can probably tell, I did manage to put my own spin on it again. These things have a tendancy to evolve a bit in the making! Never mind, still got me back into the crafting and blogging - at least for today anyway! Cool masculine card!! Mind if I case this? Feel free - I am sure you can refine it even further! !